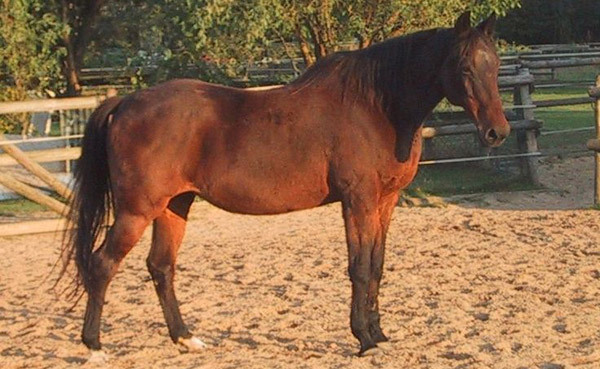 The Anglo-Kabarda is a cross between Thoroughbred & Kabarda bloodlines. To be registered they must possess no less than 25% & no more than 75% Thoroughbred blood. Created in the northern Caucasus area of the Karbardino-Balkar Republic by crossing Kabarda (or Kabardin) mares with Thoroughbred stallions. Developed in tandem with the Kabarda breed, the local people of the area needed quick, strong mounts that could thrive on the poor fodder & dangerous conditions of mountainous terrain. The best of the Anglo-Kabarda breed retains the size & speed of the Thoroughbred with the endurance & sure-footedness of the Kadarba. The local breeds were developed to live their lives outside in herds & are not provided with shelter or supplemental feed (unless absolutely necessary). Introduction of Thoroughbred blood made Anglo-Kabardas more susceptible to the harsh conditions. So a fine balance had to be struck, adding enough Thoroughbred blood for larger, faster animals – but not enough that they became unable to survive in local conditions. Horses are still very much used for transport around mountainous regions of the Caucasus, as the treacherous terrain makes vehicles impossible. The Anglo-Kabarda is appreciated for their speed & agility while remaining surefooted as well as easy to care for. They are still used to transport goods, tourists & local people over difficult terrain. Do you have images or know more about the Anglo-Kabarda breed? We’d love help completing this page, please contact us to get involved.